As a fitness and nutrition professional, you are drastically underpaid. While it really is true that you can make six to seven figures as a personal trainer, the traditional industry is not set-up to accommodate the large salary that you could and should be making. Instead, you’re stuck with a relatively small commission or an hourly pay structure. But to truly succeed in the fitness business, you must take matters into your own hands, and the only way to accomplish this is if you have multiple income streams. Ben Greenfield, the nation’s top personal training business expert, has written the book Train For Top Dollar and established this blog/podcast website to identify those streams and provide you with the exact instructions for easily commanding a high income, creating your fitness empire, and establishing yourself as a respected expert in your niche market area. Every week, Ben will supplement the information in the book with new ways and unique methods of maximizing your income and commanding your salary as a fitness professional. Are you tired of showing up to your routine personal training job each day to train a handful of clients and receive an hourly session fee? Do you have a personal training studio that struggles each month to meet the bottom line? Are you ready to command an exorbitant salary as a respected fitness or nutrition expert? 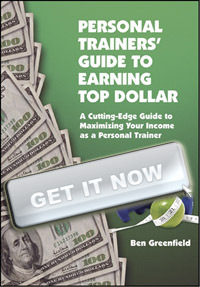 Whether you are a health club owner, private studio trainer, student personal trainer or gym employee, Train For Top Dollar will teach you everything you need to know to immediately enhance your income, while using automated money-making techniques to work as few hours as possible. Click here to order Train For Top Dollar today.